Research partners from 11 countries throughout Europe visited the Organic Research Centre in Berkshire recently to launch a new EU-funded project, which aims to help organic pig and poultry farms achieve the goal of 100% use of organic local and regional feed. This significant new project called OK-Net EcoFeed, was largely triggered by the potential end of an EU derogation, which currently allows the use of 5% non-organic protein feed for pork and poultry. An important element of organic farming is that animals are fed with feed produced at or near the farm but this is difficult to achieve in large parts of Europe. Currently feed for pigs and poultry is imported from regions far away from where animals are raised. Very often the market is reliant on imports from outside Europe (for example, China, India, Argentina, and the Ukraine), where unexpected yield losses can make it difficult for organic farmers to obtain animal feed. Organic farming has a long tradition in Europe. In the last two decades, the market for organic food has shown vigorous growth in most parts of Europe and this growth is still accelerating. However, Organic pig and poultry farmers frequently suffer from difficulties in sourcing protein feed of organic quality. This growth is particularly challenging for organic pig and poultry producers, who, to comply with EU regulations as well as maintaining consumer confidence, will in future need to source organic feed that is produced at or near the producers farm. The aim of OK-Net EcoFeed is to help farmers and stakeholders achieve 100% use of organic feed at local and regional level. European Innovation Partnership for Agricultural Productivity and Sustainability (EIP-AGRI). This policy instrument aims to foster innovation by connecting farmers and researchers. OK-Net EcoFeed started in January 2018 and will run until December 2020. The project’s kick-off meeting took place at the Organic Research Centre in Newbury, UK in January. OK-Net EcoFeed will build on the experiences of the OK-Net Arable project that established the OK-Net knowledge platform. The OK-Net knowledge platform exists for farmers and farm associations to find practical solutions in organic farming and at the same time discuss how it works in the field, in their geographic and climatic conditions. 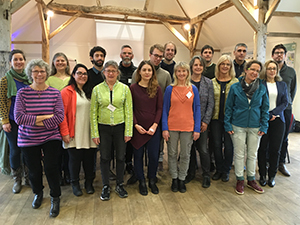 The partners of OK-Net EcoFeed are: IFOAM EU (Belgium, ICROFS (Denmark), FIBL (Switzerland), Organic Research Centre (UK), The Soil Association (UK), ITAB (France), CRAPL (France), ITAVI (France), FNAB (France), Bioland & Bioland Beratung (Germany), AIAB (Italy), SLU (Sweden), Danube Soya Austria & Danube Soya Serbia, Ecovalia (Spain), Univeridad de Cordoba (Spain), CIHEAM Naro (Italy).